Guitar strap is one of the essential accessories for guitar players, the performers on stage. Needless to say that the belt should not pick up so much color and texture as in how it mounts, stability and convenience for the musician. The straps come in several types, and differ in the type of attachment. How to choose and attach a guitar strap? - guitar strap of the desired type. Before heading to the music store for a belt, inspect the guitar and find out what type of attachment it is provided by the manufacturer. 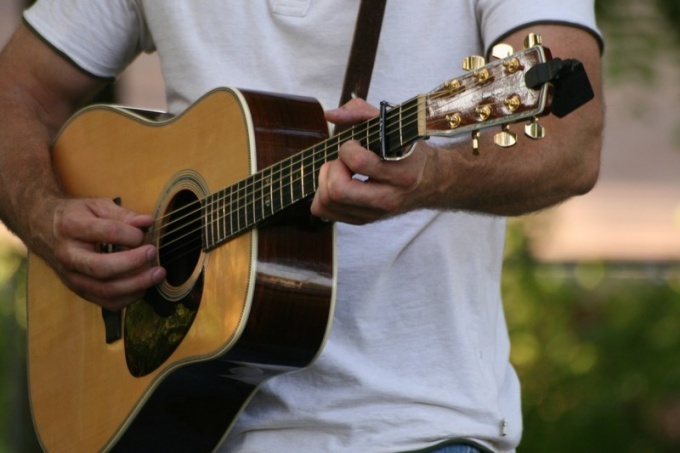 The most common variant, when the sides of the guitar are located buttons (acoustic guitar and electricguitar). The button can be located on the sidewall in the lower part of the body of a guitar or two (electric guitars). In the second variant one button located near the heel of the neck, the second in the bottom of the hull. Classical guitar buttons are often non-existent. Strap mount for options with buttons. Get the right strap, as broad as possible and with the shoulder strap. Fix it on buttons, choosing the desired length. Shoulder pad shift so that the edge of the belt digging into my shoulder. If button one, the second end of the strap cling to the headstock. Mount for variants without buttons. In this case, you need to choose the model with belt hook. Options with a single hook called "ties". Hook this strap hook over the sound hole on the top deck – socket. Guide the strap under the guitar and wear on the neck as a tie. It all depends on whether you are comfortable in this belt. Remember that in this case the tool will only stay on one hook and releasing the guitar from the hands can not, the instrument may fall. Another mounting strap for guitars without buttons – over the shoulder. This is a more reliable mount than the strap "tie". Use a strap with two hooks. Single hook hook it over the socket and flip over the shoulder. The second hook guide on the bottom under the sides and also hook it over the sound hole. The strap length adjust to your height. Keep in mind that straps with hooks hold better on classical guitars, which form a more rounded and the neckline is deeper than that of westerns. Do not attempt to drill the mounts for the buttons in the tool. This can degrade the sound quality or lead to completely unusable guitar. In extreme cases (damage, lost buttons), consult the repair with the guitar master.